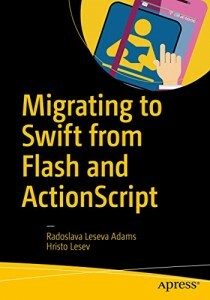 Here is our brand new book for developers, who want to sell iOS apps with Swift. 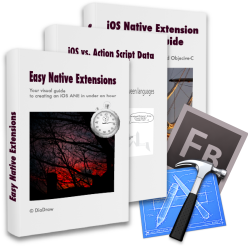 Transition to Swift quickly, build on your ActionScript experience. Migrate your existing projects to Swift. Create advanced UI, leverage the device hardware, integrate with social networks, take advantage of 2D and 3D graphics. Diagnose your app quickly with Xcode’s debugger and instruments. Prepare and submit our iOS app in Apple’s App Store. This is great – just what I need. It helps me understand Swift from an AS3 background, but it also gets me through the necessary environment / tools plumbing and shows me how to use the neat things iOS can do. It’s detailed, expert, and wry enough to make me smile. Top. @DiaDrawCom The book was great, very good tutorial and was easy to setup my custom ane. Thanks! Your eBook on ANE’s is one of the best investments I have made. The excellent explanations and example code have saved me hours of trial-and-error. And I had planned to spend a couple of weeks developing custom email and dropbox extensions. Being able to download well-documented, ready-to-build source code gives me time to add extra features to my app. Very cool. Thanks. 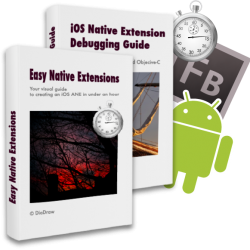 Your ebook on iOS native extensions (at least the part of it that I’ve read so far) is the best, clearest communication about software development that I’ve ever read. It is rare and completely refreshing to find programmers who can speak just as fluently and cleverly in their ‘natural’ language as in code, and who can also use elegant graphics to clear-up abstractions. Bravo, and thanks!